The only new product for Smart this year will be a full-electric version of the ForTwo (shown), which goes on sales in Europe in June. GENEVA -- Daimler AG's Smart subsidiary wants its 2012 sales to match those of 2011 despite Europe's overall new-car sales slump and the small-car brand's lack of new product. "The global Smart team is working unbelievably hard to sell more than 100,000 units again in 2012," Annette Winkler, Smart's global head, told Automotive News Europe on the sidelines of the Geneva auto show Wednesday. She said the key to reaching the target will be taking advantages of markets where new-car sales are rising, such as China and the United States. Smart sold 11,045 units in China last year and through two months it has sold about 3,000 cars in the world's largest market. In the United States, Smart sales through February were up 50 percent to 1,265 cars, according to the Automotive News Data Center. Last year Smart, which only offers the two-seat ForTwo microcar, had worldwide sales of 102,000 units. It best sales year came in 2008 when it had three model lines and reached a volume of about 134,000. Smart's global sales were up 17 percent to 16,031 units after two months this year. The ForTwo's successor as well as an all-new four-seat model won't arrive until the first half of 2014, a Daimler spokesman said. The only new product for Smart this year will be a full-electric version of the ForTwo, which goes on sales in Europe in June. The battery-powered ForTwo is expected to reach a volume of 10,000 units in a full year of sales. 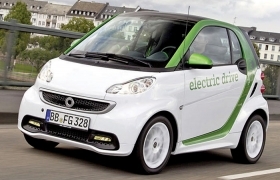 The electric Smart's starting price in Germany will be 19,000 euros. Customers also will pay about 70 euros a month for the battery, which comes with a 10-year guarantee. To maintain demand for the ForTwo, Smart will market special editions of the car so that customers can make it as individualized or as basic as they want, Winkler said. Smart also will get a sales boost from the ForTwo units that will be added to its fast-growing Car2Go car-sharing program, which has operations in cities such as Ulm, Dusseldorf and Hamburg, Germany and Amsterdam, Netherlands. "We are talking about fleets of 200 to 1,000 units per city," Winkler said. "By 2016, we want to expand Car2Go to 40 to 50 cities in Europe and 20 to 30 in North America." She said Smart also is looking into launching Car2Go in Asia.